We provide power plant consulting services, including design, analysis, startup/commissioning and structural/safety evaluations on fossil fuel, combined cycle, hydroelectric, renewables, solar, solid waste, biomass, and nuclear plants. Our work includes assisting in plant outages, providing assessments, troubleshooting/repair and Fitness for Service of equipment. O’Donnell Consulting performed the structural integrity and remaining life assessment of the main and upstream shafts of a hydroelectric plant. To see more of the projects we have worked on, see Portfolio. Our engineers perform API 579-1/ASME FFS-1 to determine Equipment Repair or Replace – as well as other Code evaluations to enable power plants to reach their maximum useful lives. See also Fitness For Service. We provide evaluations, troubleshooting, and failure investigations of various mechanical components and supporting equipment involved in drilling operations, such as blow off preventers, pumps, fracturing tanks, compressors, skids, and piping related issues. In addition, we provide safety evaluations to meet relevant standards and OSHA requirements, as well as forensic investigations & litigation support in all areas of the drilling process, including fracturing, piping, wellhead equipment, and pipelines for production. See also Forensic Engineering. For over 45 years we have been responding to the needs of the power industry. See Resume Summaries of our Team. Learn from the experience of others. Especially when one such “other” is Dr. William O’Donnell, PhD, PE, Founder and President of O’Donnell Consulting Engineers, Inc., and ASME “Engineer of the Year” – his 50 years of experience in analysis of components including fatigue and fracture safety evaluations and failure analyses are now comprised in this volume. 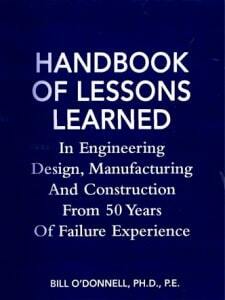 If you are interested learning more in Engineering Design, Manufacturing and Construction, as well as Failure Analysis, then this book is a must have!